Sussex returned to winning ways in the NatWest T20 Blast after an impressive comeback by their bowlers set up a seven-wicket win over Middlesex at Hove. Middlesex looked on course for a commanding score when they reached 71 for 1 in the sixth over with Paul Stirling in full flow. Stirling thrashed 52 off just 24 balls but after he departed in the seventh over Middlesex completely lost momentum. Seven of their batsmen scored between two and six as they were bowled out for 146 after losing nine wickets for 75 in 12 overs. There were still 14 balls of their innings unused and on a slow but true pitch Sussex had to take few risks as they sauntered to their target with ten balls to spare. Sussex’s fourth victory, which came after they hadn’t won in four, lifted them above Middlesex into third place in the South Group. The control Sussex had at the end was in sharp contrast to the opening overs as Stirling flayed their bowlers, hitting Tymal Mills for two sixes as well as eight boundaries. He reached his half-century in the fourth over, having put on 33 for the first wicket with skipper Dawid Malan. But Sussex began to drag it back in the sixth over when Nuwan Kulasekara yorked John Simpson (6) and then left-arm spinner Danny Briggs had Stirling caught behind trying to force off the back foot. It was a good night for Sussex’s slow bowlers, who sent down ten overs between them. Briggs and leg-spinner Will Beer had combined figures of 5 for 47 with Briggs also picking up Nick Gubbins (32), when he mis-timed a pull, and Ryan Higgins (4), to a sharp return catch, off successive deliveries. Beer claimed the important wicket of George Bailey, who was making his Middlesex debut, when he bowled the Australian through the gate before removing the dangerous James Franklin (5). Mills was expensive during Stirling’s onslaught ahead of what he hopes will be an England debut in next week’s T20 international against Sri Lanka, but he finished with 2 for 34. 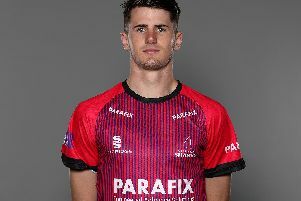 Middlesex’s hopes were briefly revived when Harry Podmore had Sussex skipper Luke Wright (23) caught behind off his first ball in the ninth over, Wright having earlier put on 46 with Phil Salt (27) for the second wicket. But Ross Taylor (33 not out) and Matt Machan (41 not out) didn’t need to take any risks and simply ticked over and put away the bad deliveries as they added an undefeated 74 in 62 balls.